This is a discography for the English alternative rock singer Morrissey. Since the Smiths disbanded in 1987 he has released 11 studio albums, two live albums, 12 compilation albums, one extended play (EP), 53 singles and seven video albums on HMV, Sire Records, Parlophone, Polydor, RCA Victor, Island, Mercury, Sanctuary Records, EMI, Reprise Records, Rhino, Decca Records, Harvest Records, Capitol Music Group and BMG. Rare Tracks is a Japan-only mini-album by Morrissey containing all six B-sides to the UK Maladjusted singles, which was released in 1997. "The Edges Are No Longer Parallel"
"This Is Not Your Country"
"Now I Am a Was"
A^ Chart position for the 2004 re-entry; the 1997 chart position was number 26. 1992 "Tomorrow" (Steve Peck Mix) Volume 5 An alternate mix of the 1992 single. 2006 "First of the Gang to Die" Music from Glastonbury the Film A live version from 2004. 2006 "Suedehead" (Sparks Mix) Future Retro An alternate mix of the 1988 single, only available on the CD version of the album. "The Last of the Famous International Playboys"
"Pregnant for the Last Time"
"We Hate It When Our Friends Become Successful"
"You're the One for Me, Fatty"
"The More You Ignore Me, the Closer I Get"
"Now My Heart Is Full"
"In the Future When All's Well"
"Earth Is the Loneliest Planet"
"My Love, I'd Do Anything for You"
"All the Young People Must Fall in Love"
D^ "Glamorous Glue" was originally from the 1992 album Your Arsenal. It was not released as a single in 1992 (in any format, in any country), but made it to number 13 on the US Modern Rock charts as an album track that year. 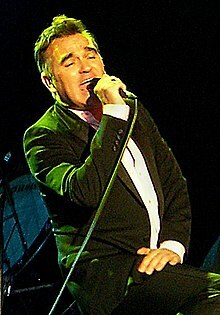 The UK chart position is for the 2011 UK single release, done to promote the Very Best of Morrissey compilation. E^ "Satellite of Love" did not chart on the Billboard Hot 100, but peaked at number 1 on the Hot Singles Sales chart. 1989 "The Last of the Famous International Playboys"
1990 "November Spawned a Monster"
1992 "We Hate It When Our Friends Become Successful"
2005 "There Is a Light That Never Goes Out"
2008 "That's How People Grow Up"
Top 100 (Australian Music Report) peaks to 19 June 1988: Kent, David (1993). Australian Chart Book 1970–1992 (Illustrated ed.). St. Ives, N.S.W. : Australian Chart Book. p. 208. ISBN 0-646-11917-6. N.B. the Kent Report chart was licensed by ARIA between mid-1983 and 19 June 1988. "Suedehead" (Australian Music Report) peak: "Australian Top 50 Singles Chart – Week Ending 15th May, 1988". ARIA. Retrieved 4 March 2016. 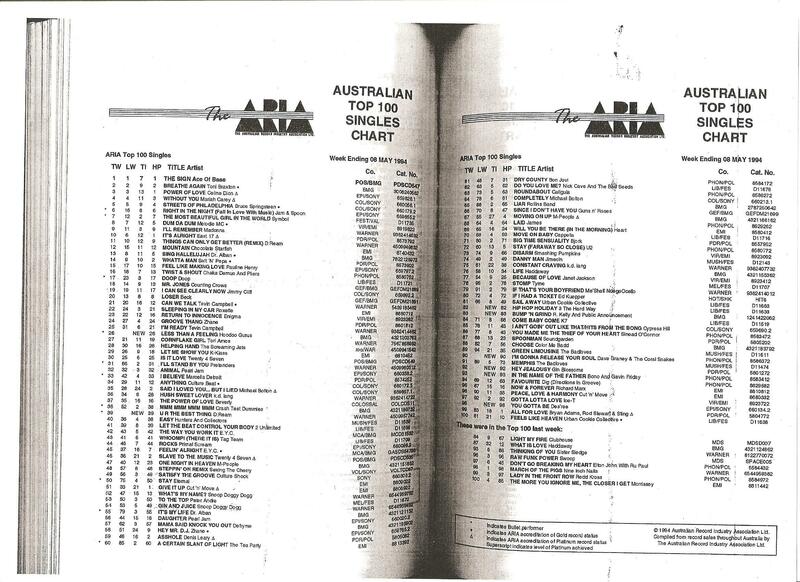 Top 50 (ARIA) peaks from 26 June 1988: "australian-charts.com > Morrissey". Hung Medien. Retrieved 4 March 2016. "The More You Ignore Me, The Closer I Get" (ARIA) peak: "The ARIA Australian Top 100 Singles Chart – Week Ending 08 May 1994". Imgur.com (original document published by ARIA). Retrieved 4 March 2016. N.B. The HP column displays the highest peak reached. 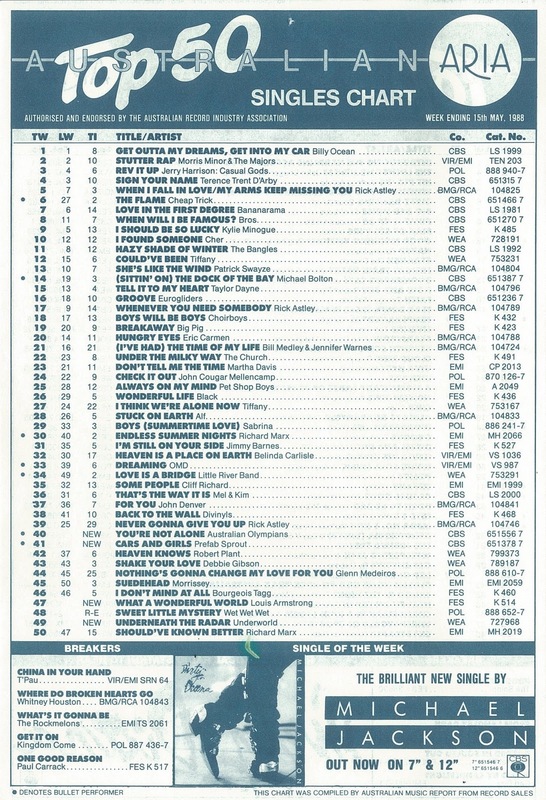 ARIA albums chart peaks to February 2009: "The ARIA Report: Week Commencing 23 February 2009" (PDF) (991). Pandora Archive (original document published by ARIA). 20 March 2009. Retrieved 17 January 2015. World Peace Is None of Your Business (ARIA) peak: "The ARIA Report: Week Commencing 21 July 2014" (PDF) (1273). Pandora Archive (original document published by ARIA). 22 July 2014. Retrieved 17 January 2015. "The Last of the Famous International Playboys" and all ARIA singles chart peaks outside the top 100 to 20 September 2017: "Response from ARIA re: Morrissey singles chart history, received 20 September 2017". Imgur.com. Retrieved 20 September 2017. N.B. The High Peak number in the NAT column indicates the single's peak on the national chart. Low in High School: "ARIA Chart Watch #448". auspOp. 25 November 2017. Retrieved 25 November 2017. ^ "Discographie Morrissey" (in German). Austriancharts.at. Retrieved 9 July 2008. ^ a b c "RPM Chart Archives". Library and Archives Canada. Retrieved 18 July 2008. ^ a b "Discography Morrissey". Danishcharts.com. Retrieved 9 July 2008. Before 1995: "Sisältää hitin: Levyt ja esittäjät Suomen musiikkilistoilla vuodesta 1961: MOK – MOY (The Finnish Charts since 1961) > Morrissey". Suomen Lista Levyt. Retrieved 20 August 2015. After 1995: "Discography Morrissey". Finnishcharts.com. Retrieved 20 August 2015. ^ a b c "Discographie Morrissey" (in French). Lescharts.com. Retrieved 9 July 2008. ^ "Discographie Morrissey" (in German). Austriancharts.at. Retrieved 25 July 2014. ^ "Irish Music Charts Archive". chart-track.co.uk. Retrieved 28 August 2014. ^ a b "Discografie Morrissey" (in Dutch). Dutch Charts. Retrieved 9 July 2008. ^ a b "Discography Morrissey". Norwegiancharts.com. Retrieved 9 July 2008. ^ a b c d "Discography Morrissey". Swedishcharts.com. Retrieved 9 July 2008. ^ "Discographie Morrissey" (in German). Hitparade.ch. Retrieved 9 July 2008. ^ a b c "Morrissey > Charts & Awards > Billboard Albums". Allmusic. Retrieved 9 July 2008. ^ a b c d e f g h i j "Certified Awards Search". British Phonographic Industry. Archived from the original on 17 January 2010. Retrieved 27 August 2009. Note: User needs to enter "Morrissey" in the "Search" field, "Artist" in the "Search by" field and click the "Go" button. Select "More info" next to the relevant entry to see full certification history. ^ a b "Gold and Platinum: Searchable Database". Recording Industry Association of America. Archived from the original on 26 June 2007. Retrieved 9 July 2008. ^ a b c d "Morrissey". Chart Stats. Retrieved 12 November 2009. ^ Leight, Elias. "Morrissey Announces New Album 'Low in High School'". Rolling Stone. Retrieved 22 August 2017. ^ "Le Top de la semaine : Top Albums – SNEP (Week 47, 2017)" (in French). Syndicat National de l'Édition Phonographique. Retrieved 28 November 2017. ^ "Irish Albums Chart: 24 November 2017". Irish Recorded Music Association. Retrieved 25 November 2017. ^ "Sverigetopplistan – Sveriges Officiella Topplista". Sverigetopplistan. Retrieved 25 November 2017. Click on "Veckans albumlista". ^ Strauss, Matthew (26 February 2019). "Morrissey Details New Album Ft. Grizzly Bear's Ed Droste, Green Day's Billie Joe Armstrong, More". Pitchfork. Retrieved 2 March 2019. ^ "UK Top 40 Hit Database". Everyhit.com. Retrieved 14 July 2008. "The Irish Charts – All there is to know". Irish Recorded Music Association. Retrieved 9 July 2008. "irishcharts.com – Discography Morrissey". Hung Medien. Retrieved 17 July 2014. ^ a b "Morrissey > Charts & Awards > Billboard Singles". Allmusic. Retrieved 9 July 2008. ^ "My Love, I'd Do Anything for You". ^ "All the Young People Must Fall in Love". ^ "MESSAGES FROM MORRISSEY - MORRISSEY CENTRAL - BACK ON THE CHAIN GANG". MORRISSEY CENTRAL. Retrieved 1 November 2018. ^ "Gold & Platinum". RIAA. Retrieved 10 April 2019.